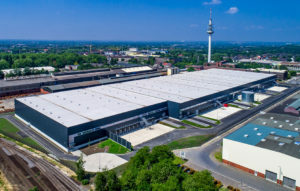 Tritax EuroBox buys logistics warehouse near Bochum- Tritax Eurobox has announced today that they have acquired a prime, new modern logistics warehouse near Bochum, in the Rhine-Ruhr region of Germany (which they describe as a core established logistics area). Tritax has divided the 36,400 sqm building into four units with eaves height of 12 metres. The first unit going to SVH Handels GmbH who is a subsidiary of the Wurth Group. They are a worldwide wholesaler of 125,000 products for the trade and craft industry, with annual turnover of €12 billion. The second unit is being leased by WM Group GmbH who is a logistics service provider that is part of LB GmbH, who employ 800 people across Germany, Austria and the UK. The remaining spaces will be leased by a company that is provided by Dietz AG. Dietz AG is Tritax’s manager in Germany. The total cost is €35.7 million (excluding purchaser’s costs), reflecting a initial yield of 4.9%. The building is in a established logistics location right in the heart of the Rhine-Ruhr region of Germany with direct access to the A40 and A43 motorways. It also has excellent logistics links with excellent access to railways, motorways, and roadways. With the region’s dense population there is high occupier demand and low vacancy rates. The terms of the lease for SVH Handles is seven years meanwhile the terms of the lease for both WM Group and the company that Dietz provides is five years. Dietz will have a small interest in the acquired asset.